RIYADH, Saudi Arabia (CNN) -- The Taliban in Afghanistan have momentum that makes any effort to negotiate with them difficult, the U.S. defense secretary said. 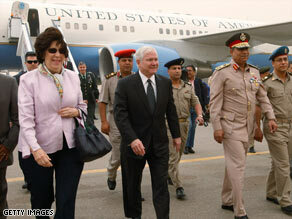 Defense Secretary Robert Gates arrived in Cairo, Egypt, on Monday. He's visiting Afghanistan on Wednesday. Secretary Robert Gates spoke to CNN's Chris Lawrence in an exclusive interview Tuesday evening before leaving for Afghanistan, where he is visiting troops and bases Wednesday. "The political level of the Taliban probably isn't ready to think about reconciliation or any kind of accommodation at this point," Gates said in the interview. "They probably feel like they have the momentum with them. And until that momentum changes, it will be difficult." As part of the U.S. strategy in Afghanistan, the military and Afghanistan government are attempting to reach out to elements of the Taliban who are engaged in the battle for financial gain, rather than ideological gain. "There are really two groups we're talking about -- the younger, or less committed, who do this mainly to earn a living and put food on the table for their families, and those that are more ideologically committed. The latter are going to be a tougher pull, and we'll probably have to wait awhile before there's an opportunity there." On Monday, CNN's Nic Robertson interviewed a spokesman for the Taliban, Zabiullah Mujahid, who said the Taliban will only negotiate with the Afghanistan government when the United States leaves the country. "Our conditions are clear, we want to negotiate and they [the U.S.] will not interfere in our affairs; secondly, they [the U.S.] will leave the country," Mujahid told CNN. Gates said the stance was not surprising. "Well I don't know what else he'd say. He's leading the opposition, he's leading this insurgency. He's not going to sort of, sort of throw down and say 'We're ready to negotiate, we're about done here,' " Gates said. The United States is adding 21,000 troops to the Afghanistan battlefield. The majority will be moving to the south to confront the Taliban along the porous Pakistani border. The Taliban have had mostly free rein in that area with few U.S. or coalition forces to confront them until now. Gates admitted moving the battle to the south will mean there is "a tough fight ahead." "I think, certainly, I have been pretty clear. As we move into areas of the south that have not seen any Afghan or coalition forces so far, we're clearly going to be going into areas where the Taliban are very entrenched," he said. "And, sad to say, I expect with the rising level of our activity and operations, there probably will be higher casualties." In recent weeks, the Pakistani government has seen the Taliban gain control on its side of the Afghanistan-Pakistan border. Privately, Pakistani officials have expressed concern to the United States that the increased fighting in southern Afghanistan will only push the Taliban back to the Pakistani side. "Well I think it's just the reality that there are extremists on both sides of that border. And they threaten both the elected government of Afghanistan and the elected government of Pakistan. So like it or not, they both have a certain common enemy," Gates said. Gates said he is encouraged by recent cooperation efforts between the two countries to deal with the problem, and by Pakistan's recent confrontation with the Taliban in Bunir province, near the capital of Islamabad. "The signs right now are pretty positive," he told CNN.